Country: USA Wingspan: 30' 4"
The Monocoupe was introduced in 1926 by Don Luscombe (Later of Luscombe Aircraft fame). The company took off in 1928 when Willard L. Velie of Velie Automobiles and the maternal grandson of John Deere joined forces with Don Luscombe. 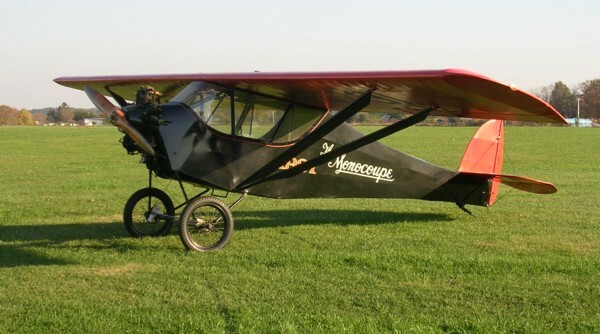 The Velie Company provided the new Velie M5 radial engine and this launched the Monocoupe to stardom. By 1929 it was said that a full ten percent of all registered aircraft in the United States were Monocoupes. The model 70 was one of the earliest designs of the Monocoupe Company that built several larger and more powerful models well into the 1930s. The museum's Model 70 was donated by "Breity" Breithaupt in 2007. This famous airplane was the center piece of the Antique Airplane restaurant in Reading, Pennsylvania. Breity restored the airplane in the early 1960s and flew it only a few times before hanging it in his restaurant were it remained for over forty years. It is one of the remaining few model 70s left in existence maintained in airworthy condition.